Welcome September and hello Spring! My absolute favourite season of the year is here and I’m more than just excited. September is going to be a busy month for most of us with school holidays and heightened activity on the social calendar. I believe busy schedules can be best dealt while wearing comfortable outfits. So, let’s talk about a best of both world’s outfit idea, blending comfort with STYLE. 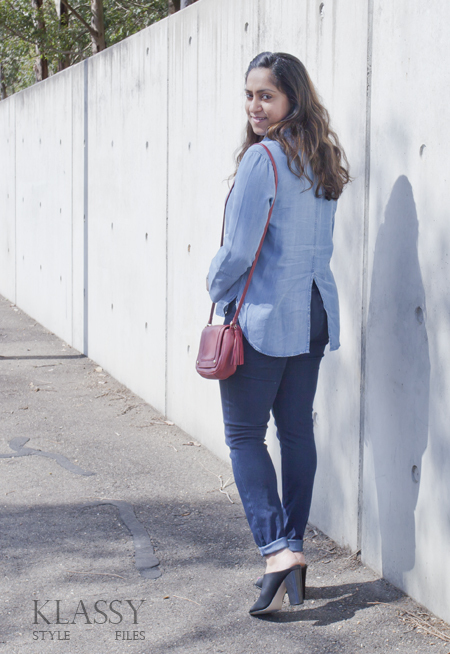 Double denim is super hot this season and the good news is that I’ve found the PERFECT super soft chambray shirt with an effortless fit and affordable price tag: The ‘Kmart chambray shirt’. This chambray shirt is made of Lyocell fabric and is soft as soft can get for a chambray shirt. Priced at $20, I think it is very unlikely to find anything better or even similar at this price point. The slight bell sleeves and the faux pocket stitching add pleasant extras to the character of the shirt. It even has a split back design that makes the shirt sit comfortably around the tummy area (a real advantage for camouflaging awkward bulges!) I went up a size because I was after a relaxed fit that works well with these slim fit jeggings. 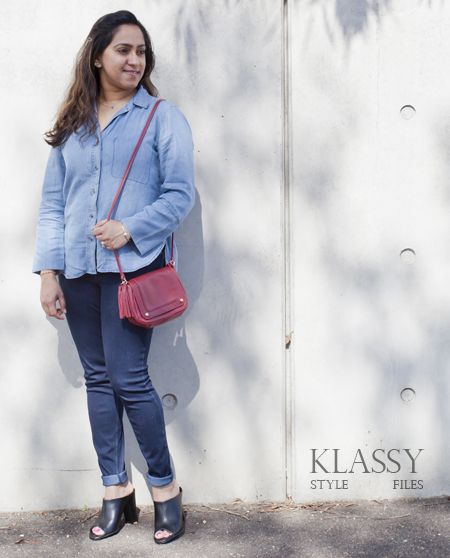 Double denim is an easy chic option and there are plenty of inspiring outfit ideas to choose from. I even participated in Kimba Likes’ Instagram challenge that had the exact same theme last weekend. 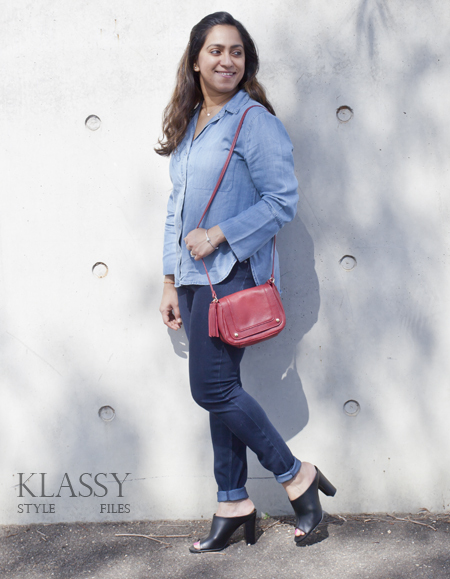 Check out Kimba’s ideas here and more #everydaystyle ideas at Styling You here. Keeping accessories minimal did the trick for me. The peep toe mules are spring chic and a ‘marsala’ cross body bag along with bright toe nails added the desired pop of colour. 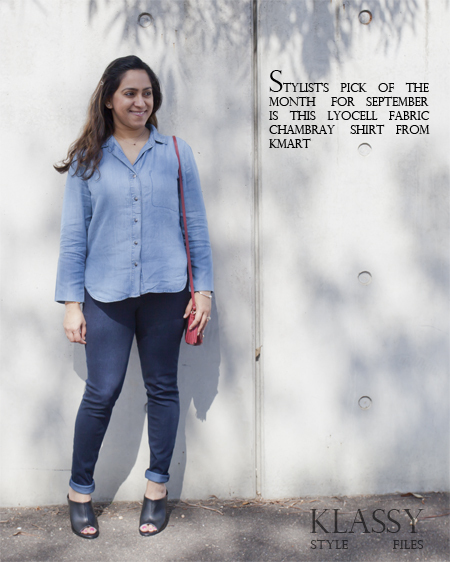 Also, watch this space for the stylist’s pick of the month accessory post for September. Note: This is not a sponsored post. The opinions expressed here are my own based on my experience of this great quality Kmart purchase. I love chambray and a shirt should be in everyones closet. I agree Vicki, chambray shirt is a wardrobe staple! Fabulous double denim style. Love a Kmart bargain too! I got a great chambray shirt at Kmart! 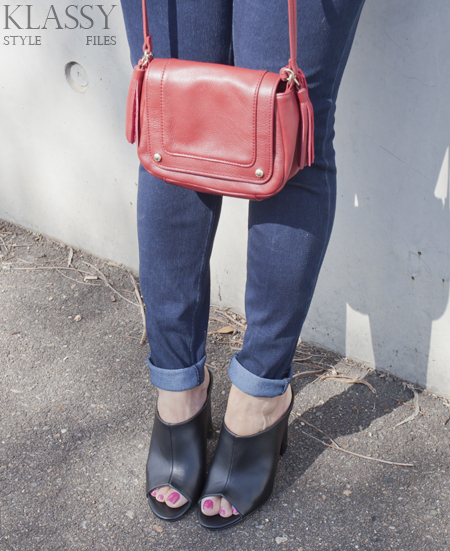 I styled my Factorie one on my blog today haha! That’s great Em! Chambray shirt is such a versatile piece..